We’ve been told to never trust a skinny chef - to think twice about someone who doesn’t seem to buy into whatever he or she is peddling. And considering the debate regarding Groupon’s effectiveness as a marketing channel, Groupon is starting to look a little slight around the lovehandles. I’m thinking that they need to eat a piece of their own cake while we all watch – they need to offer a Groupon for Groupons. Doubts about Groupon are high right now, with e'eryone weighing in like it’s the first day at Heavyweights’ Camp Hope. The question is: do Groupon promotions bring in enough new faces and buzz to outweigh the revenue lost from regulars showing up with coupons, or regulars avoiding the Groupie swarm and not showing up at all? Groupon needs to do something about it – because unless you sell duct tape, doubt isn't usually healthy for business models. This is half a strategy recommendation and half me doing my best Omar, calling Marlo Stanfield a “punk” in the streets. Here is how I want Groupon to eat their cake and shut us up. 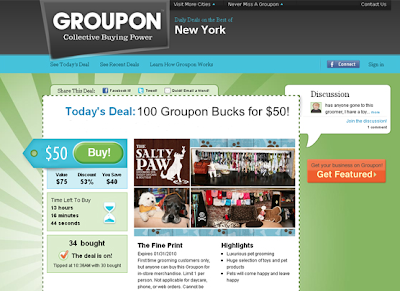 Groupon requires participating businesses to offer customers at least 50% off of their goods and services – so Groupon should do the same. Sell us Groupon Bucks at 50% off: 100 Groupon Bucks redeemable on future Groupon offers ($100 U.S. value) for only $50. Shouldn’t be a problem, right? Cuz if honesty is indeed their number one policy, Groupon for Groupons’ll turn out to be marketing gold. But maybe Groupon will politely decline, arguing that Groupon promotions work better for restaurants and yoga studios than for billion dollar ecommerce sites; Maybe Groupon is right in their choice to flood every ad slot across the entire internet with their “1-day deal” adwords ads, instead of taking advantage of their own marketing platform. To which I have two things to say. 1. Do it anyway: Get like a career politician about the situation and take up an initiative that you know isn’t really gonna work but will play well with your constituents and committee chairmen. And second: Amazon.com just ran a promotion on one of the Groupon mini-me’s, LivingSocial. So if the Groupon steep-discount model is good enough for the king of the ecommerce jungle, then it should be plenty palatable for the gander himself. To Andrew Mason: offer the Groupon for Groupon only to new customers; or offer the Groupon on a Groupon gift card; or make it so that 1,000,000 people have to buy the deal in order for the sale to “tip”. It doesn’t matter how you do it Andrew, but if you believe in your platform and prefer the rest of us to continue to share in your belief…. well, you know what to do.